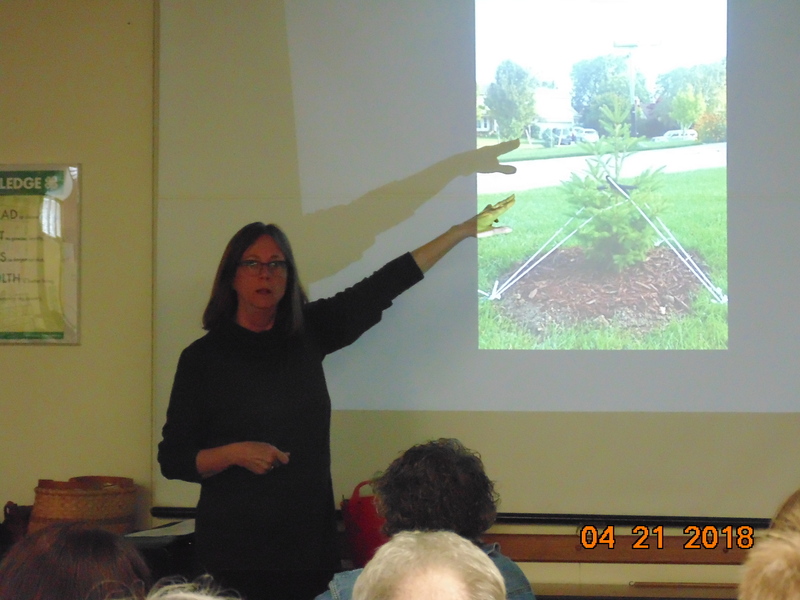 Our speaker at the last Monroe County Master Gardener & horticulture club mtg. was Gail Morrell-. The title of the program was Learning from the Past-28years. She spoke of monitoring and identifying problems we found with our plants. To assist us with this, each person was given a samples of boxwood to examine-when you found a deformity on the underside, we were to pick it open, which exposed a very lively worm, aka the boxwood leafminer. 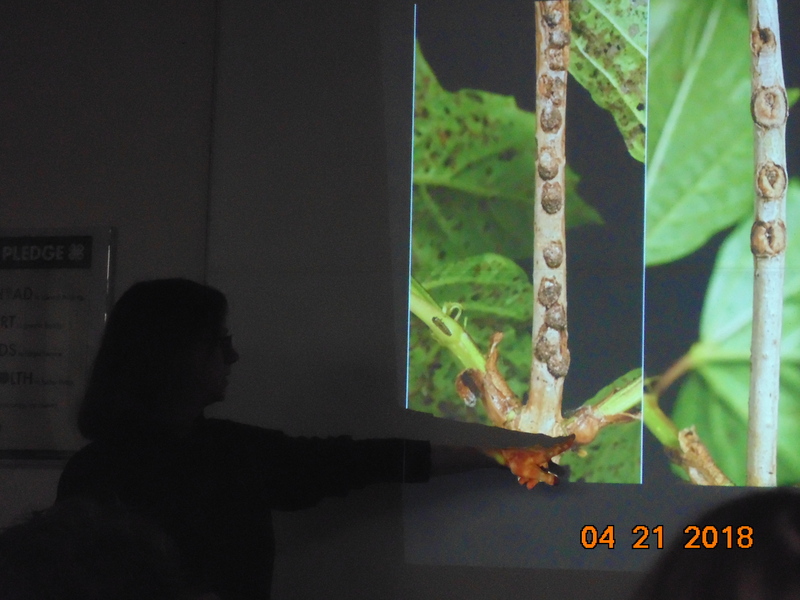 The next topic was the viburnum leaf beatle. Look for the scales on the wood and cut it off and destroy. Attached to her hand outs was a list of pesticides that are in routine use by today’s gardeners. area treated. 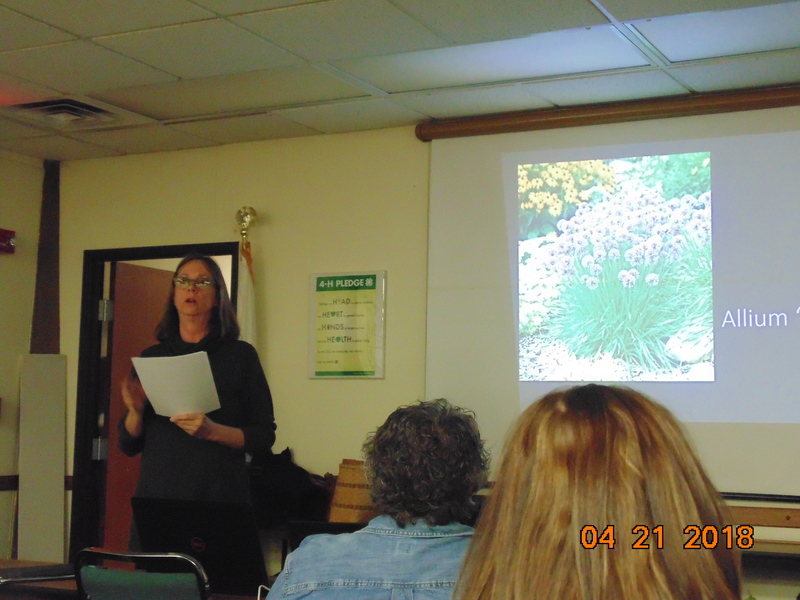 In more general terms she talked on birds and their need for bugs to eat-raising the caterpillars of the Monarch butterfly & the plants from the perennial of the year list from the perennial plant assoc. .
Let’s discuss some drought tolerant, interesting and colorful foliage. 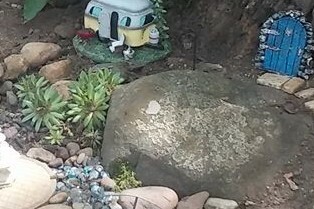 Ranking on top for this gardener are succulents. 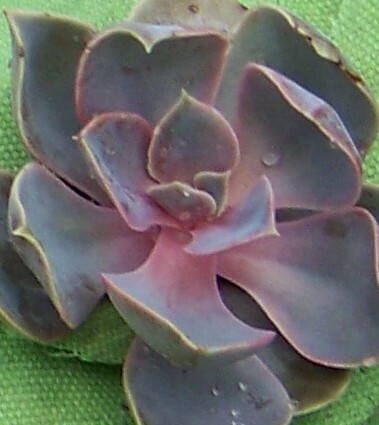 Succulents are easy to grow and propagate. They are often grown for their striking and unusual appearance. They are quite drought resistant. Their leaves and stems are usually thick and fleshy. 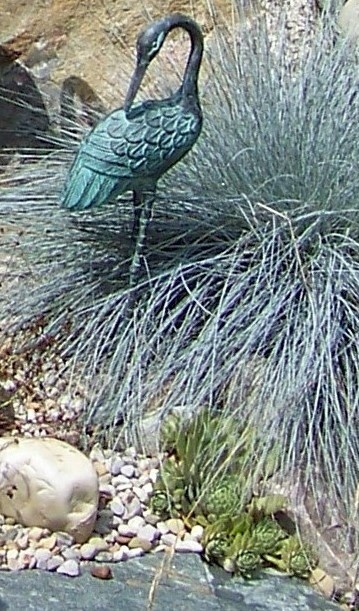 This aids the plant in retaining water in dry climates. 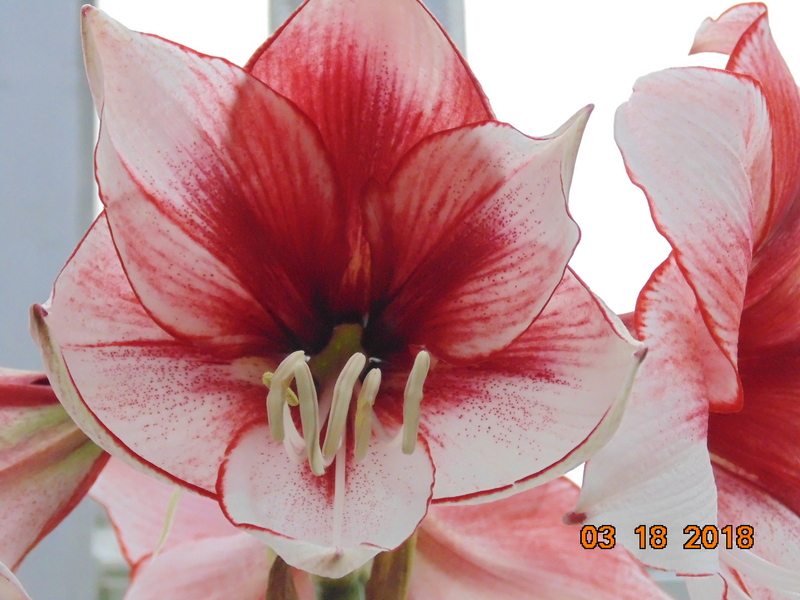 Many do have spectacular blooms and add additional interest beyond their foliage. 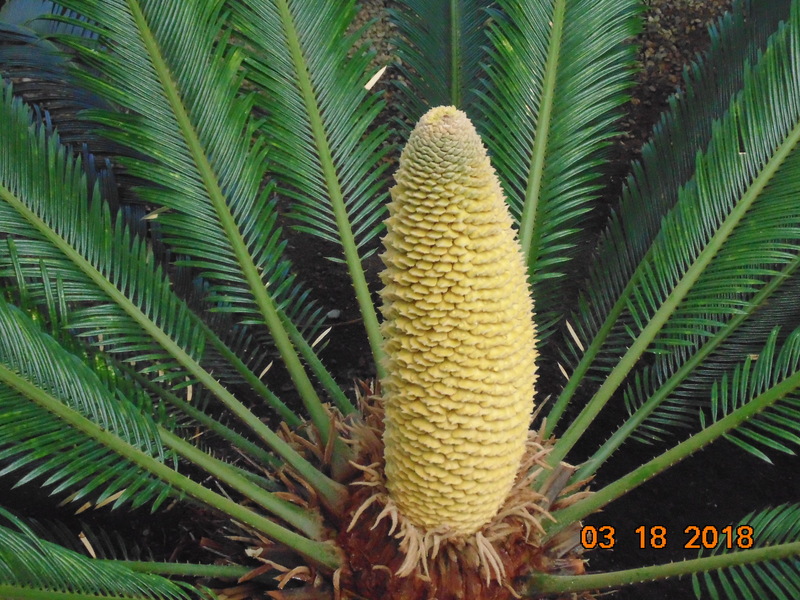 Let’s take a look at the forms of these interesting plants. Many appear to be artwork and add an interesting architecture into the garden. 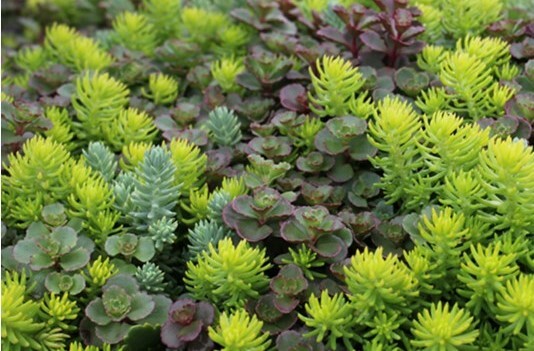 Succulent spring foliage of Sedum ‘Autumn Joy’. During the summer it gives you an interesting mound of green. 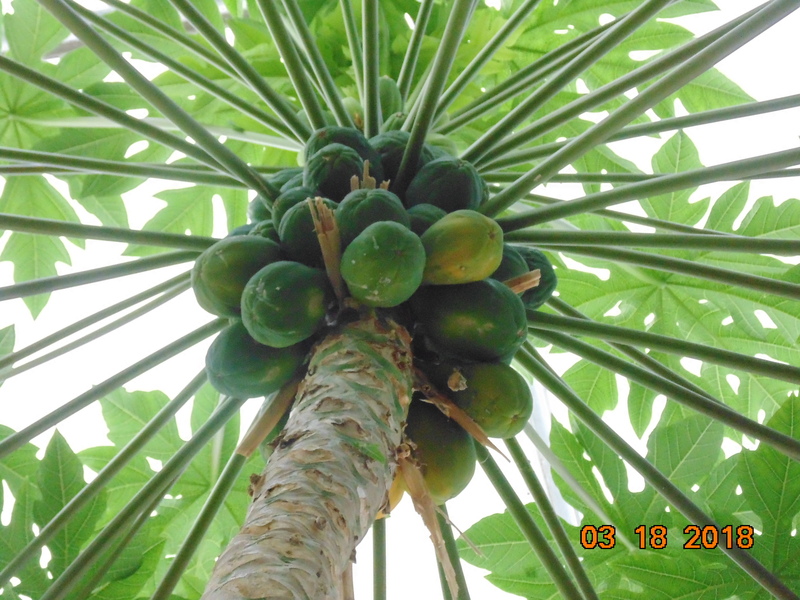 Each stem has an open rosette shape making a nice cluster of green. 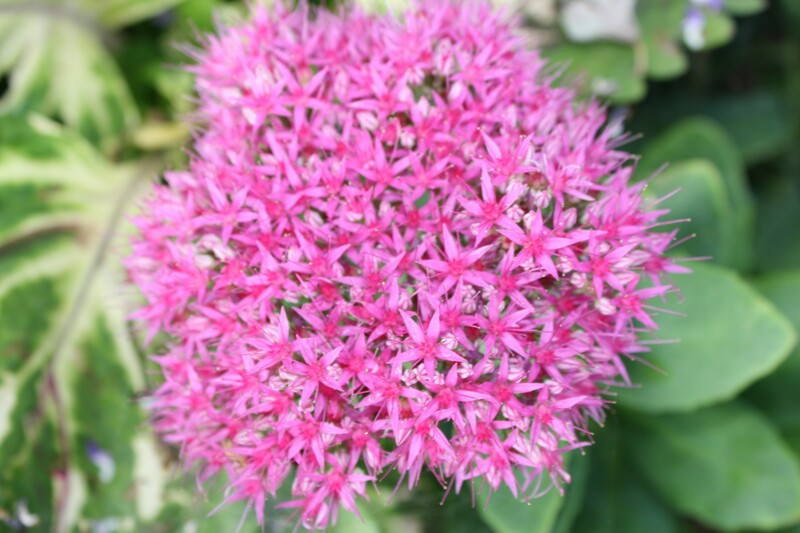 As a bonus in the fall, you get a wonderful cluster of small florets that form a bloom. It also has great winter interest. 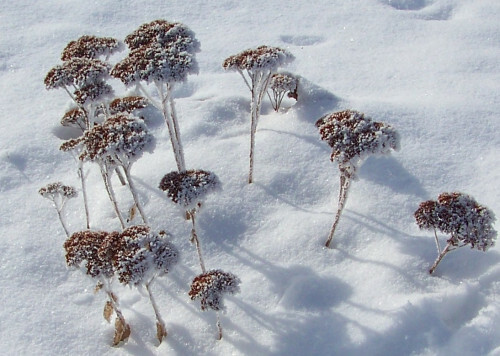 The dried blooms pop up through the snow and add an interesting element in the winter garden. 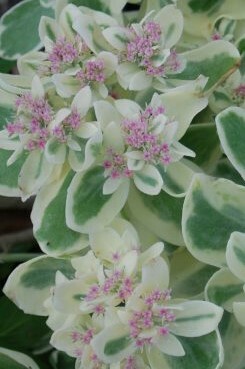 Another great one to grow is Sedum ‘Frosty Morn’. It can get a bit leggy and floppy, so it needs pinched back in early summer. In cooler areas like Michigan it gets a pink bloom. It will be white in hotter climates. 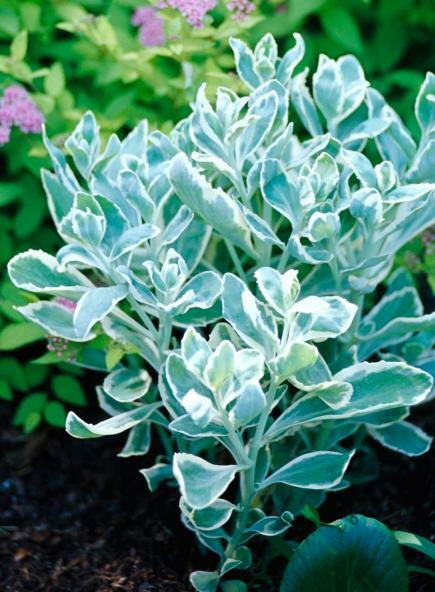 It has great variegated foliage when not in bloom. 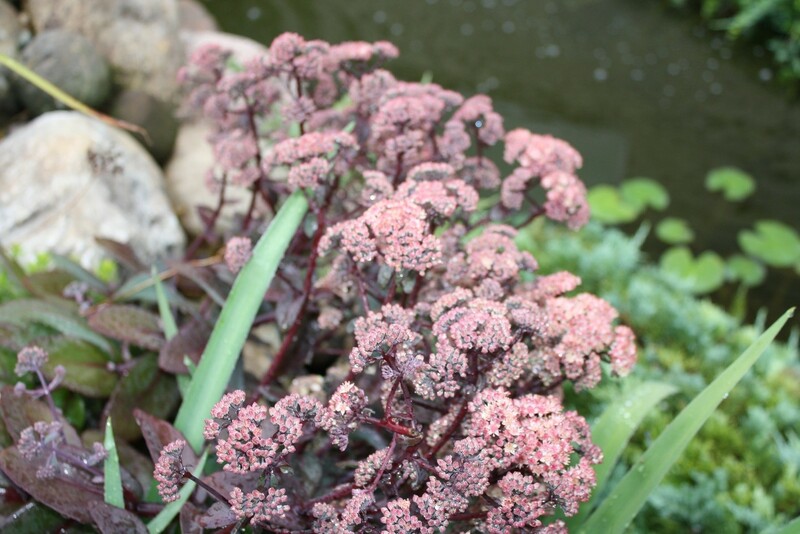 Enjoy the deep burgundy color of Sedum ‘Purple Emperor’. Although it does have a great blooming quality, I still want to include it for the great colorful wine color. 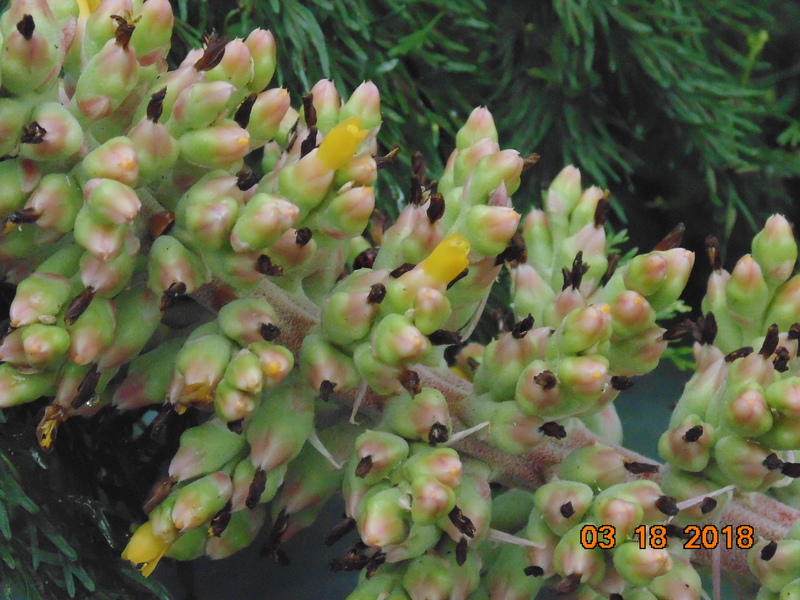 Sedum has a wide range in colors. The blue and yellow greens are a favorite. 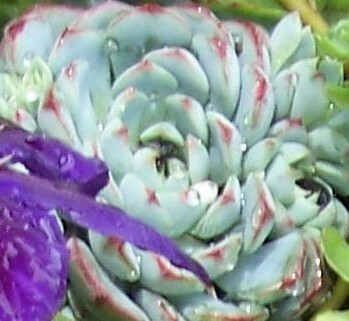 This group of succulents typically are found in a low growing rosette form. 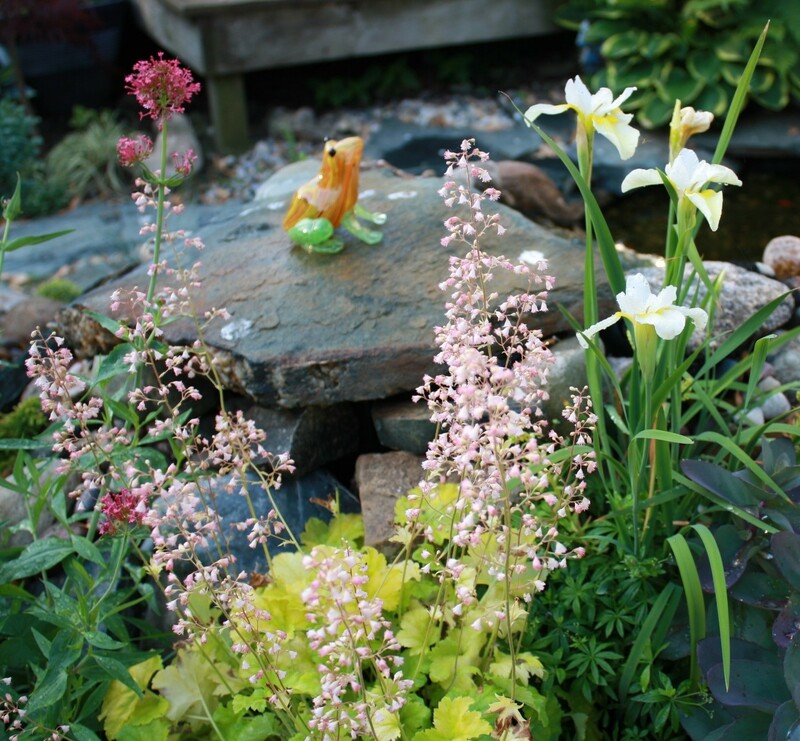 They carry a wide range of colors and are a great addition to a fairy garden or rock garden. 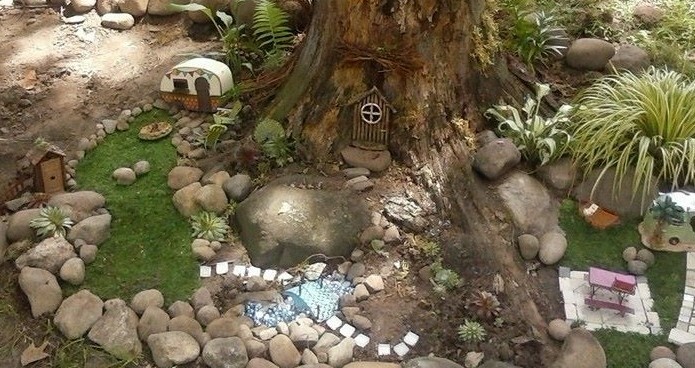 Below you see them scattered in this camping fair garden. The babies are great for the miniature gardens. Another that will grow in our area. I once had this in my garden, but have removed it due to the thorns it develops. It gave interesting form and some structure, but the benefits didn’t outweigh the thorns to me. In spring and summer is would develop a gorgeous yellow bloom however. Sorry, I just don’t have a photo of it any longer. It will spread fairly quickly. I also use succulents that are not winter hardy. Although they can be costly, you can clean them off in early fall to overwinter in the house. Keep them near a sunny window if possible and don’t overwater. It sometimes can be tricky figuring out where to put them. I enjoy using these succulents in some unusual ways. Experimenting is part of gardening. 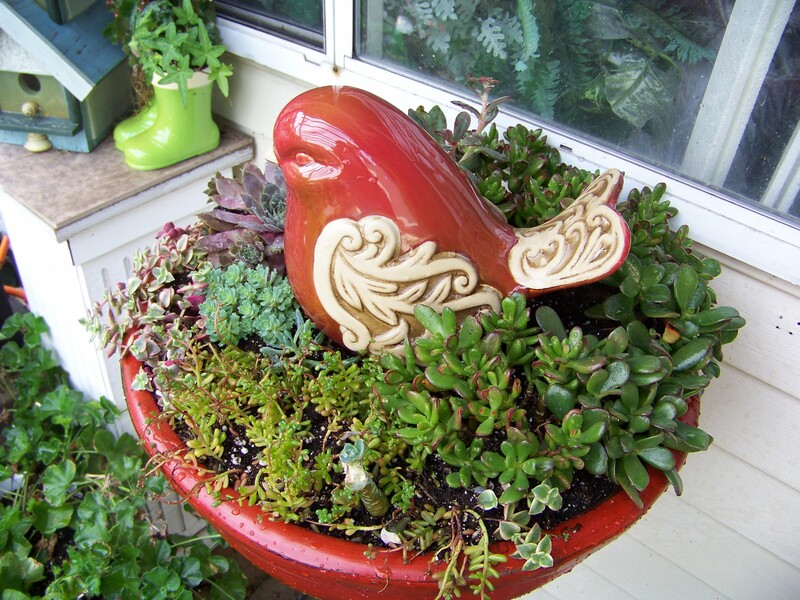 Here are some photos of unusual plantings with this succulents. Yes, I planted them in a pillow. I made a small slit in the pillow to insert a small fabric pouch of soil. They don’t require much soil. I’ve even had success with just the pillow media. They sure added interest and a great conversation piece in the garden. I use a spray bottle to water them. That keeps the frame from getting too wet and falling apart. 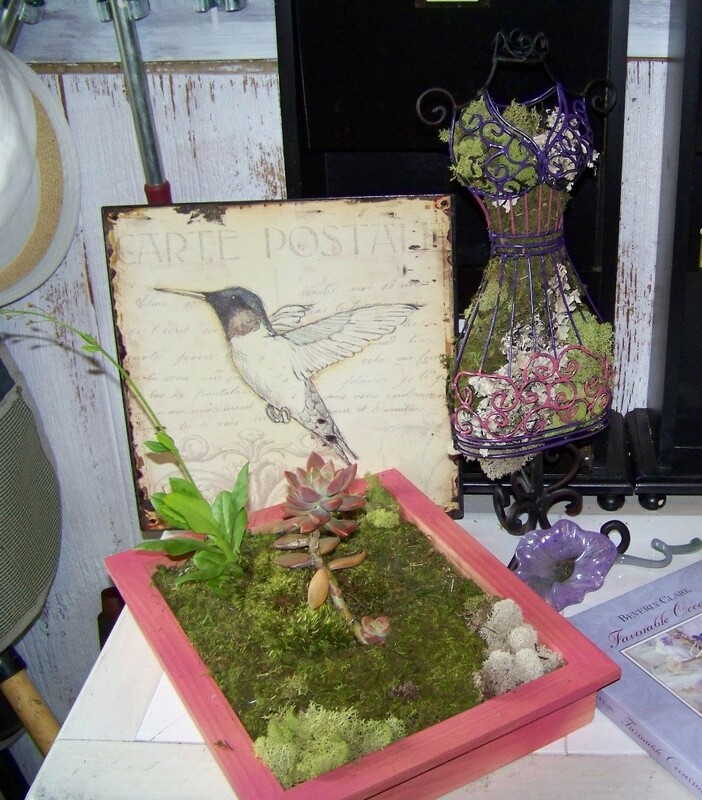 A low container with an added fairy give a nice decorative planting to a table. 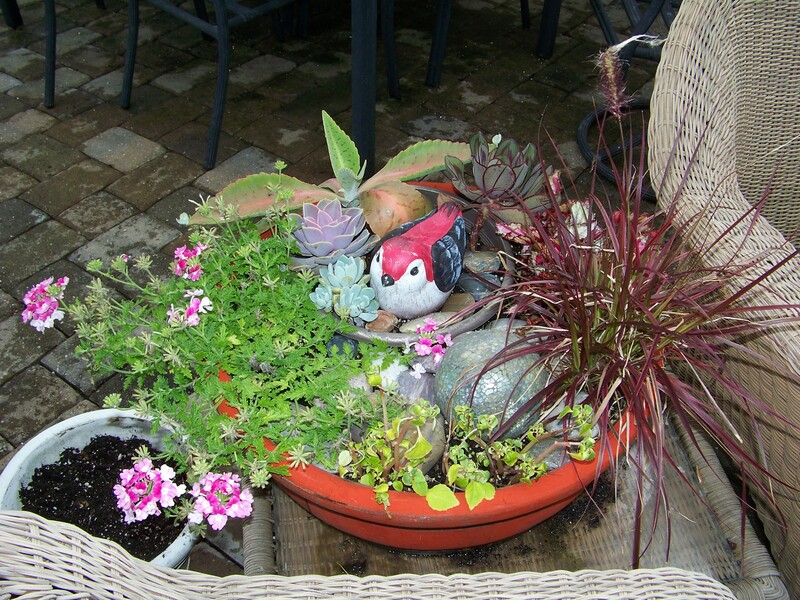 I included a blue fescue grass and a Heuchera as well. They seem to survive well with a moistened soil. 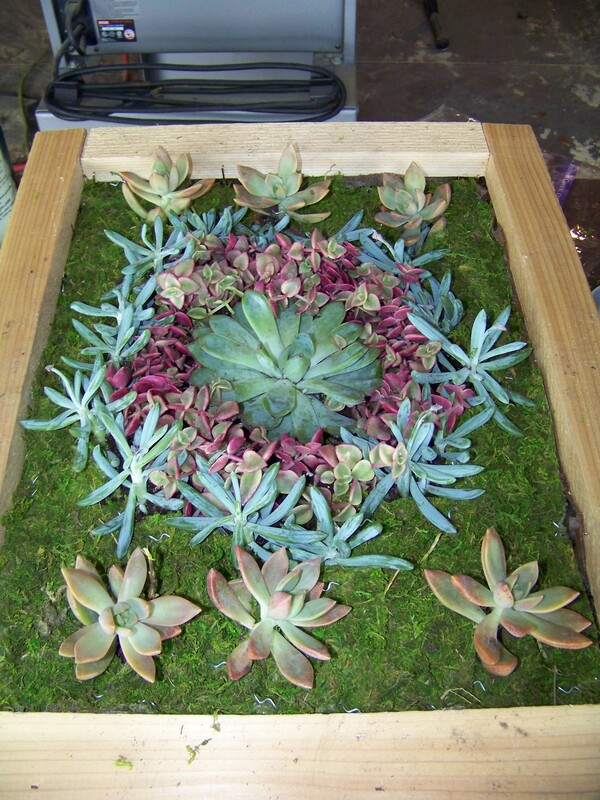 Here is a wooden container with a variety of succulents incorporated: As you can see I enjoy adding decorative garden items within my plantings. 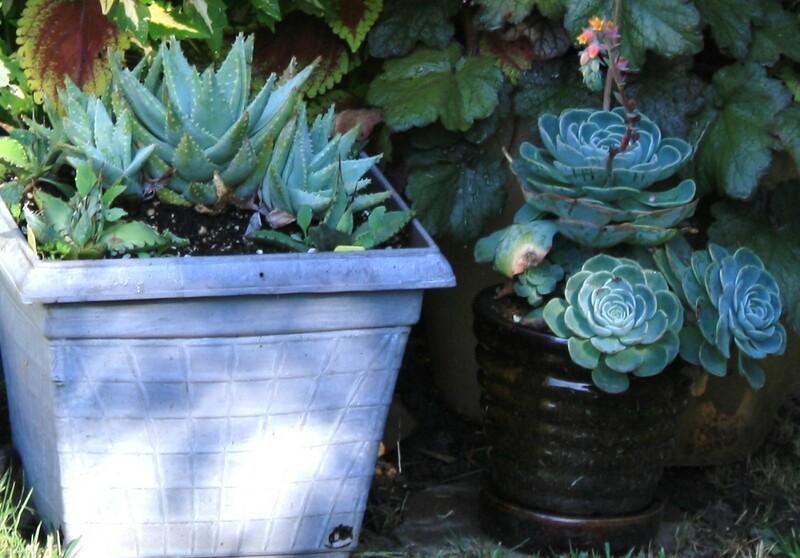 Succulents can be combined with plants that need higher levels of water. Just add them into a second container. 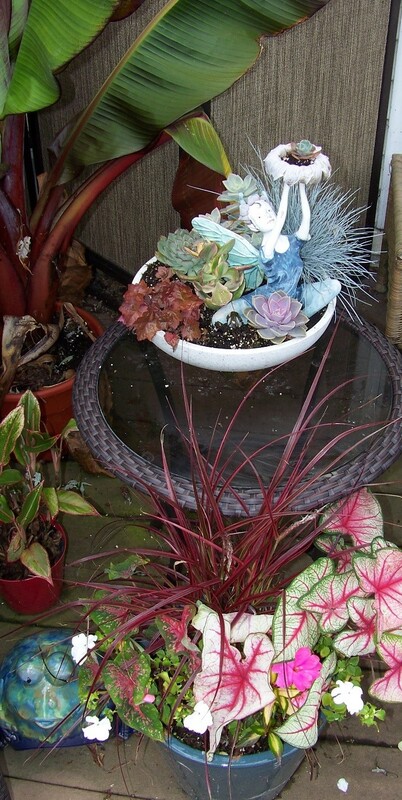 Give the outer section the abundance of water those plants need, while adding less water in the succulent container. You can see the smaller container within the large container separating the wet and drought tolerant plantings. 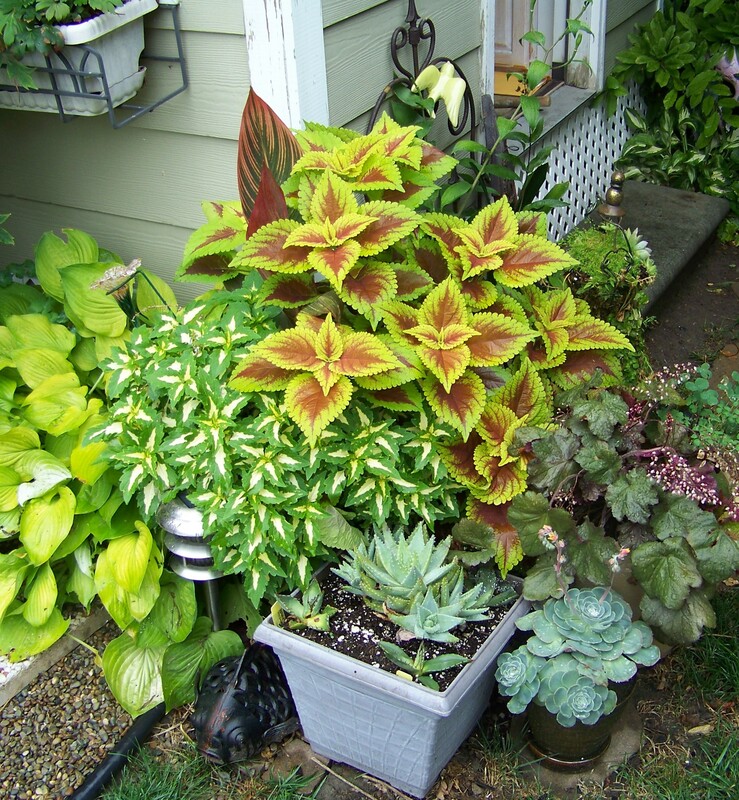 You may recall the following photo from my coleus posting. The agave thrived very well in this container. 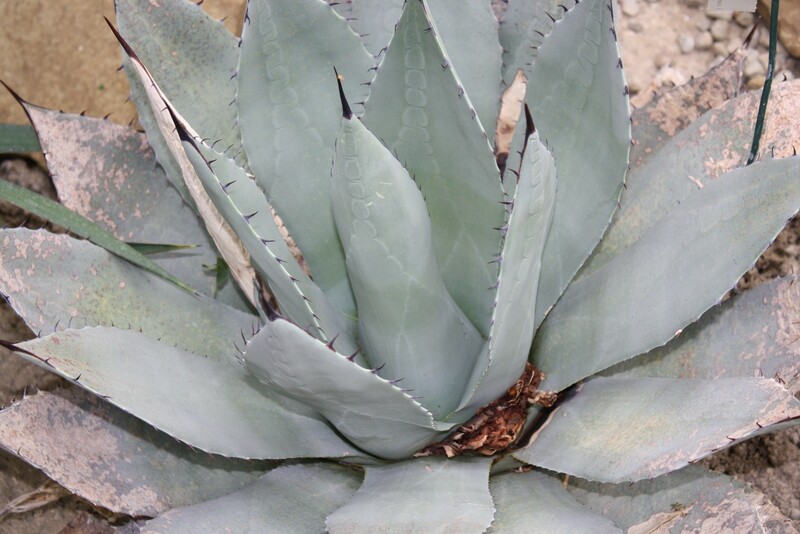 Here’s a closer look at the beautiful rosettes and spiked contrast of the agave. By the end of the season, the agave was so large (about 18”) the pot could no longer handle it. I repotted it into a larger, much heavier container and took it in for the winter. I lost it last year to a freeze. I just didn’t get it inside in time. They grow fast and I will again add it to my garden. Caution, they do have a sharp spine like needle at the end that can do some damage. 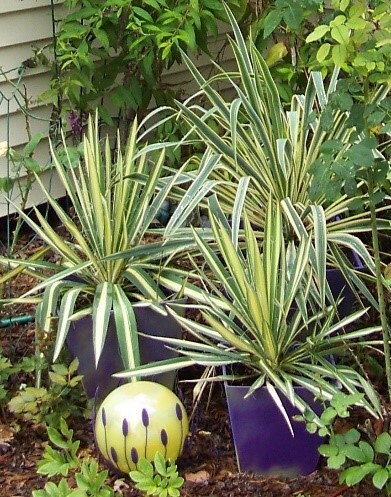 Yucca is another good container plant. They seem to do well in the microclimate on the north east side of my house. 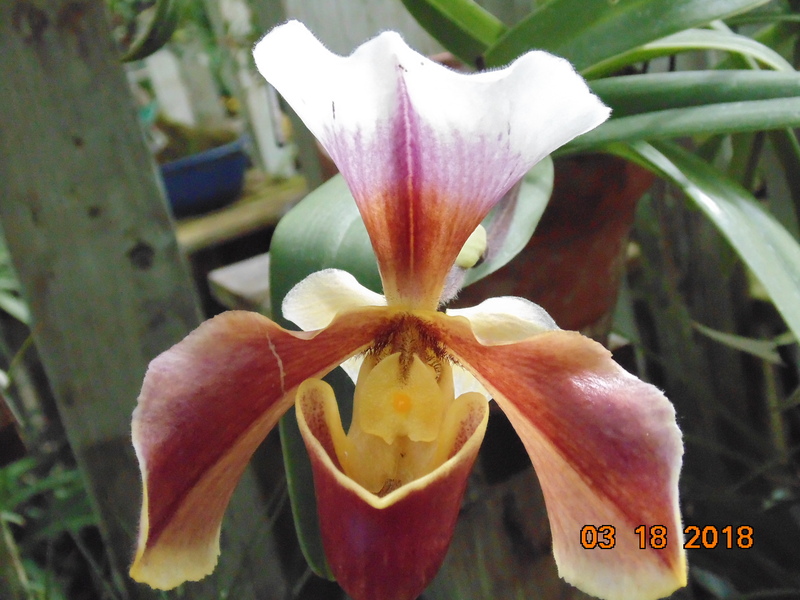 This one has great variegated colors. Notice that the one is different than the other two. At first glance they all appear the same. 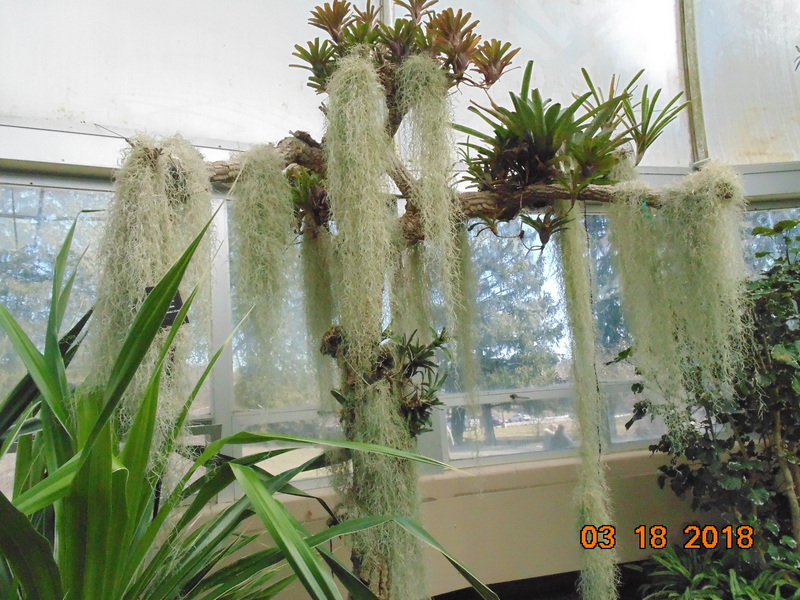 The two in the foreground have green on the edge of its sword shaped leaves and yellow green centers…the large one in back is reversed in color. 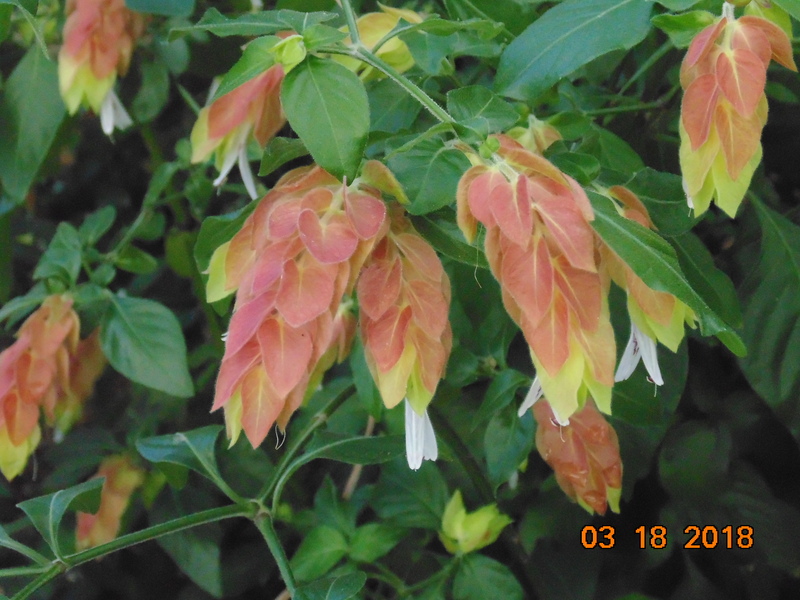 They have not bloomed in the containers, however when planted in ground, they often have a tower of bell shaped flowers on a stalk. They can be aggressive and will send out roots that form new plants. The root of the Yucca is edible. According to a few internet sites I visited, it helps with the immune system, cholesterol levels, heart rate, and diabetes. 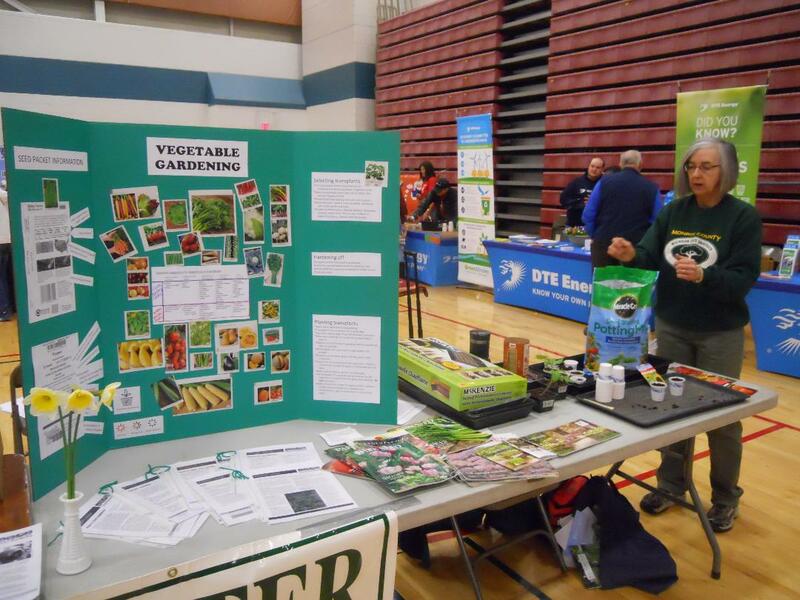 It’s great to hear the benefits of our plants. There are also some non-winter hardy plants you can use outdoors then transfer indoors. 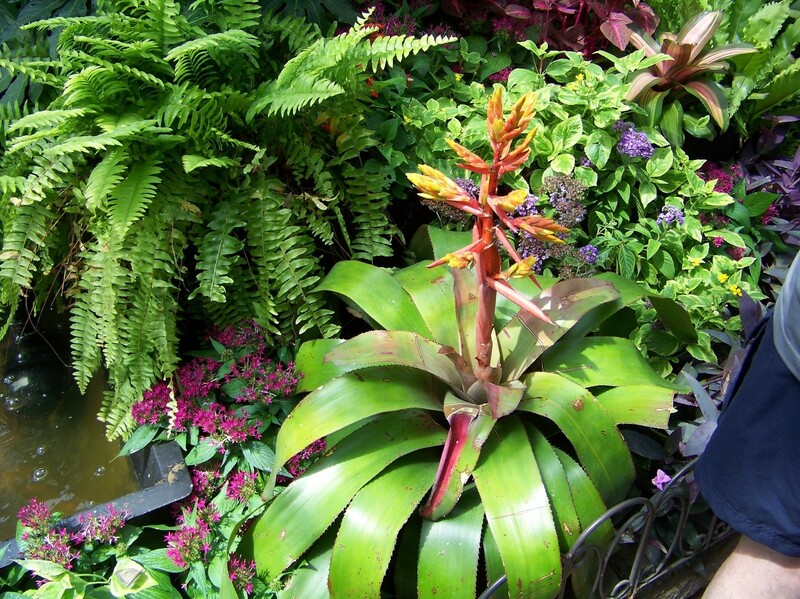 Bromeliads are another interesting drought tolerant plant. When watering you add the water in the base of the plant. It will store the water there until needed. 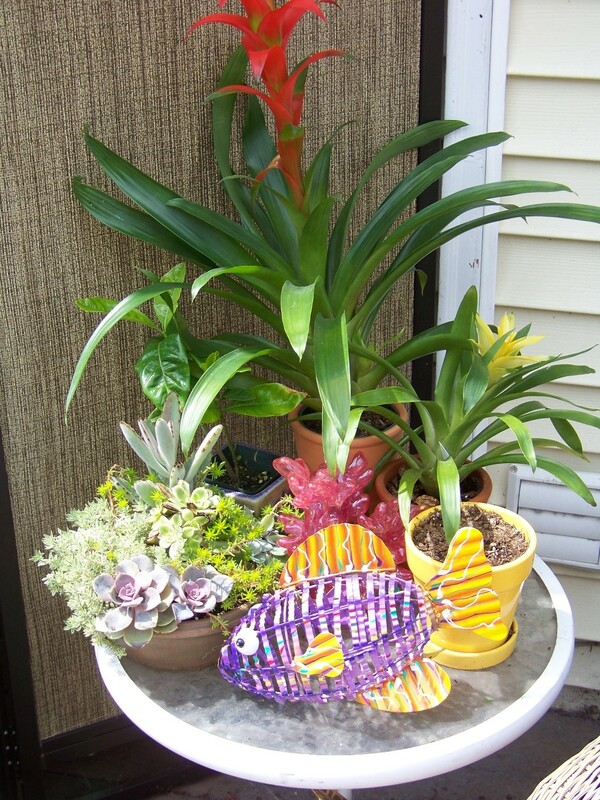 A decorative fish brings out colors in the bromeliads and succulents on a table. These interesting plants like to be watered in the center. It holds the water there until needed. Vertical gardening is one of my favorite things to do. I use a product called a wally pocket. It’s made from recycled materials. Here you see them used in a commercial garden wall. 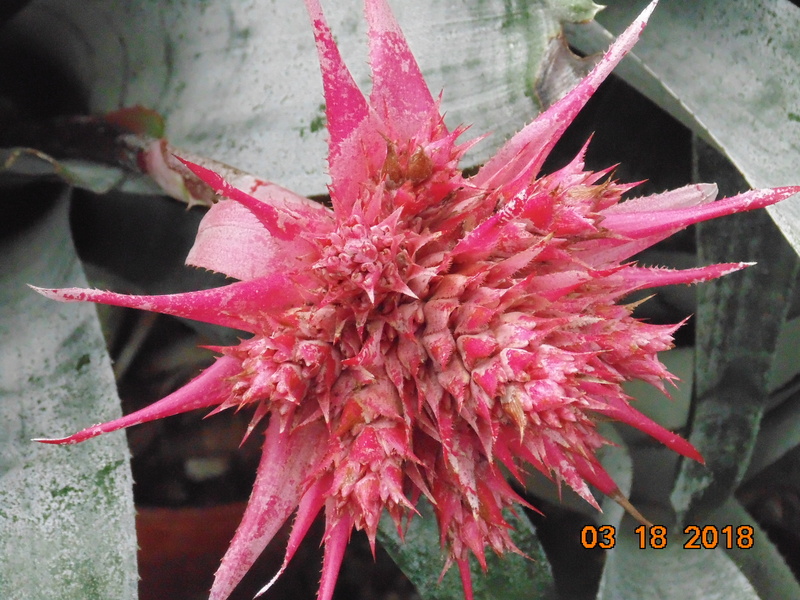 The bromeliads are repeated in a pattern. This makes for a stunning art piece. Cost may be prohibitive in doing a project this large, however, a scaled down version can work on a garage or shed wall. 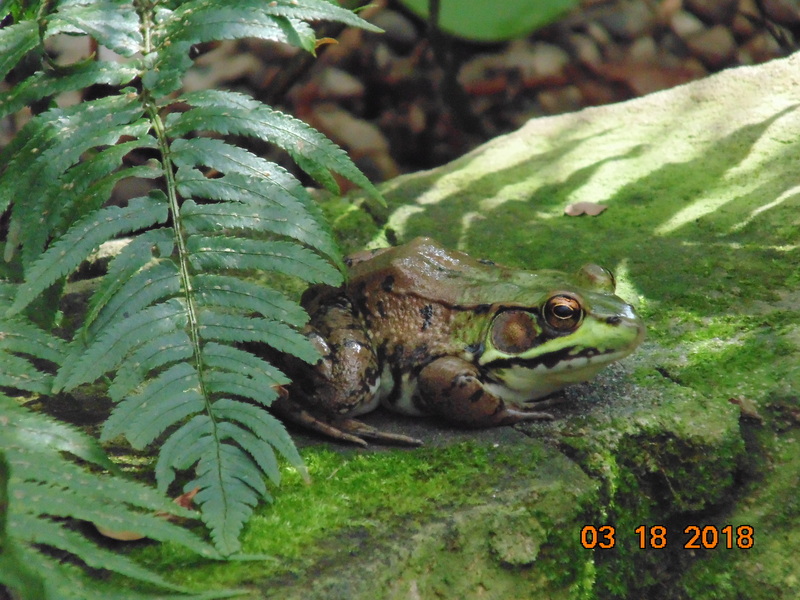 I have a large photo library from botanical gardens visited. 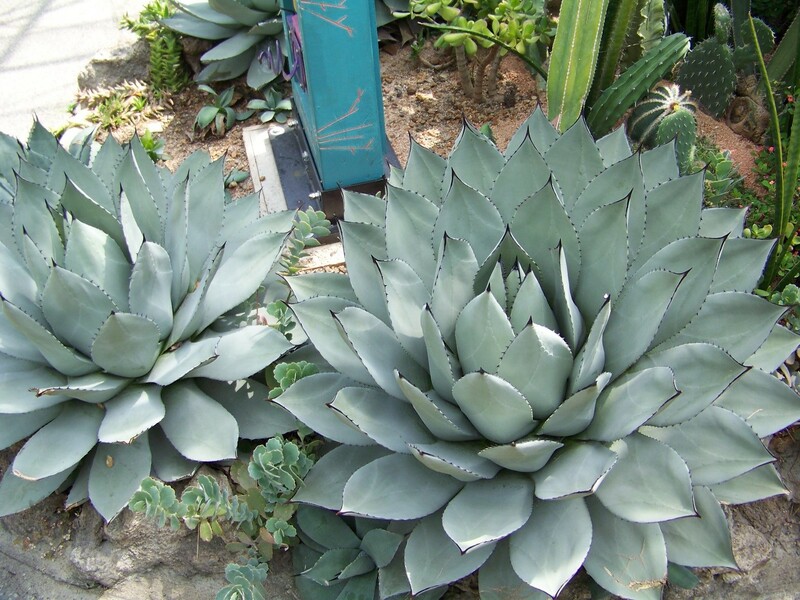 There are so many more interesting drought tolerant plant that have great shapes. 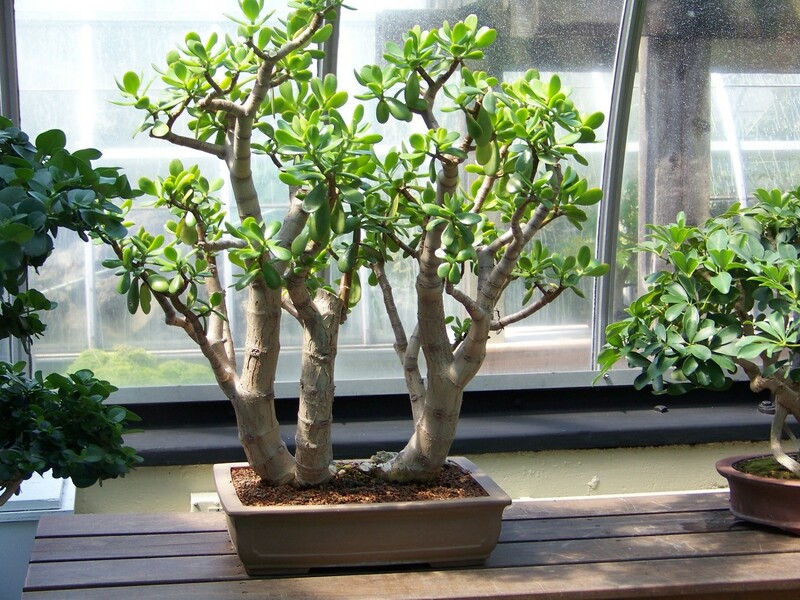 Jades can make great Bonsai plantings. Agave at Hidden Lake Gardens in the Arid Dome. Agave at Krones Conservatory, Cincinnati, Ohio. 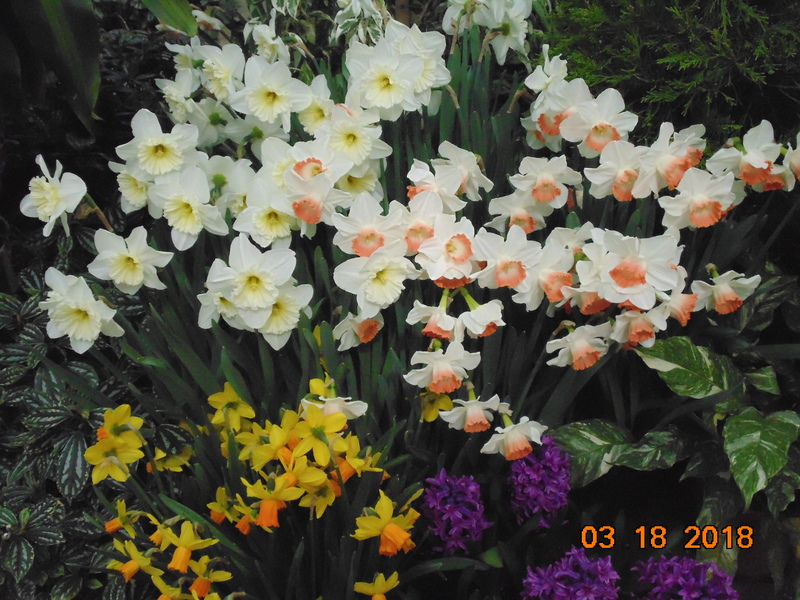 I hope you add one or more of these this year to your garden. 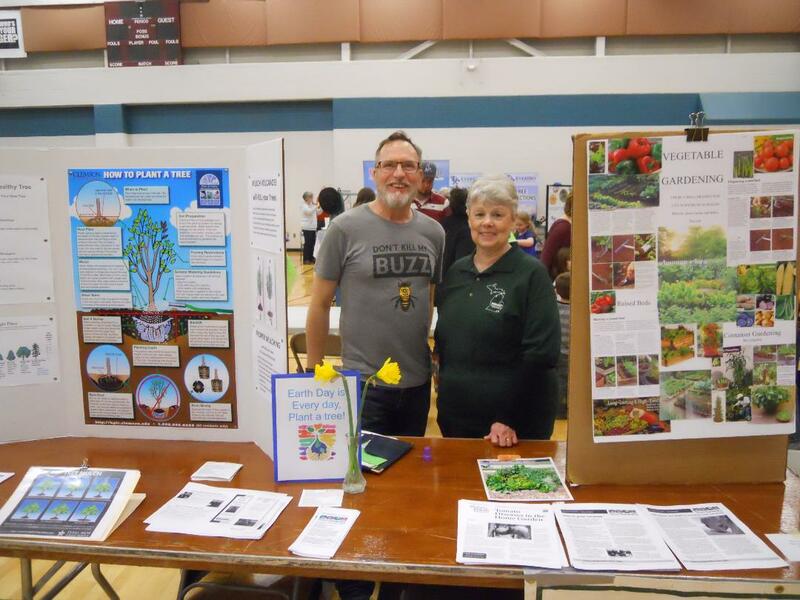 Thanks to these Monroe County Master Gardeners for representing us at the Earth Day event. Another staple of my garden is Heuchera. I use it both in ground and containers. It will overwinter in a container. 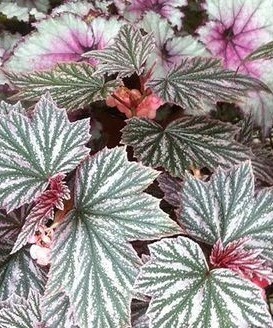 Heuchera foliage comes in so many colors. 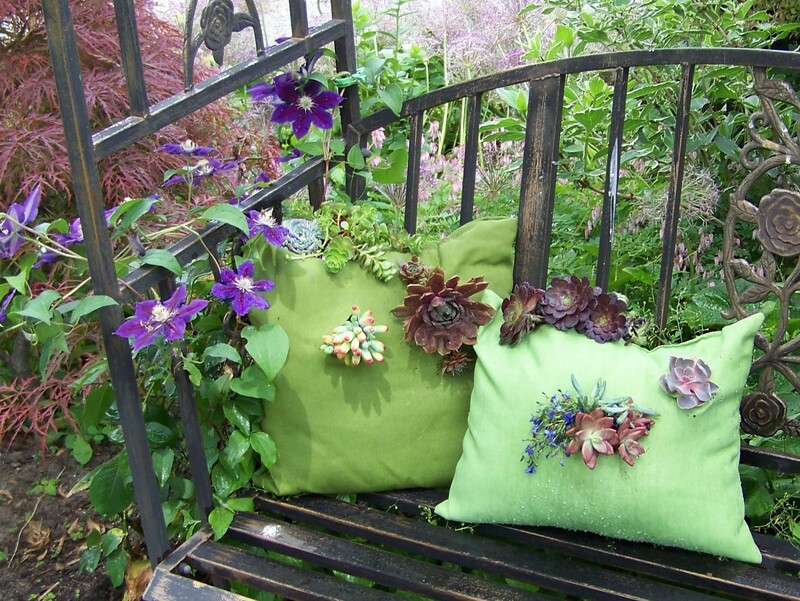 In the garden they offer red, burgundy, deep purple, lime green, sage greens and a variety of orange tones. I enjoy pairing them with some garden accessories. 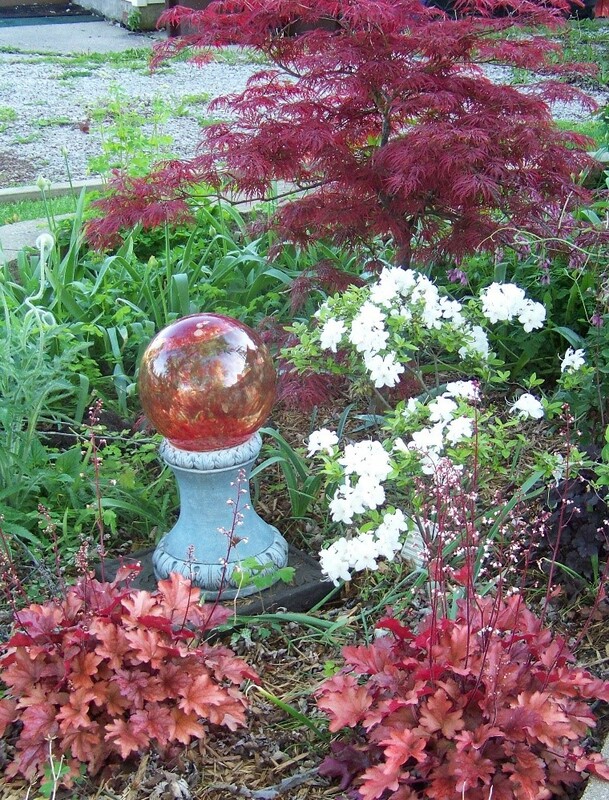 These were matched to the gazing ball; which was purchased to match the color of the Japanese maple. The name is Heuchera Berry Smoothie. It offers both reds and a rust orange shade. 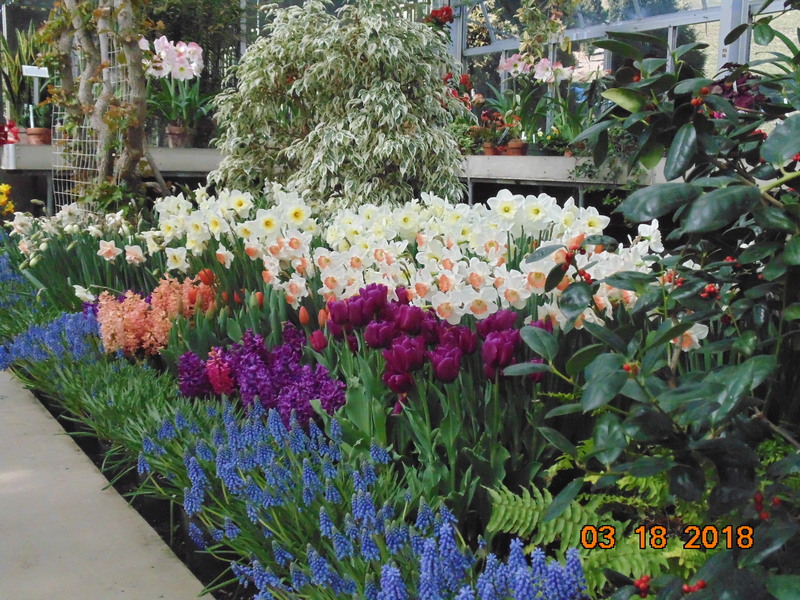 The photo was taken in early spring when the azalea blooms are a great contrast in this setting. Here you see Palace Purple. It plays off very nicely with the blue tones and browns of a gong. Purple Palace also is a good match with a Japanese maple. The gazing ball matches the colors of ‘Caramel’. 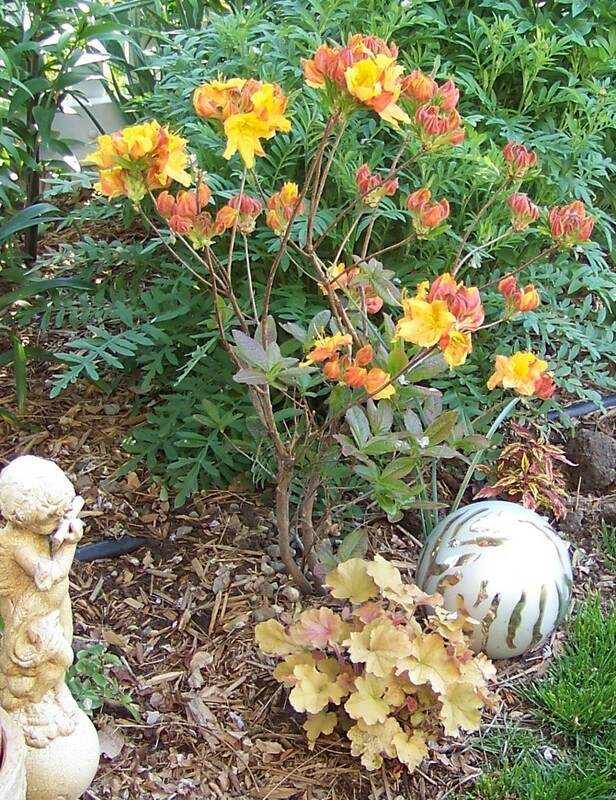 In spring it contrasts with the yellow and orange on this deciduous azalea. 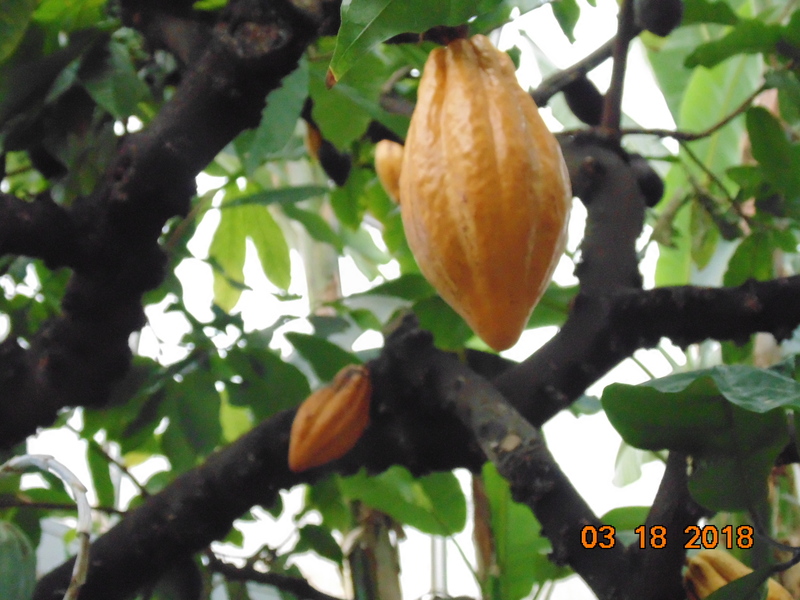 The color deepens to a darker caramel as it matures thru the summer. A young coleus, on the other side of the gazing ball, gives the color match during the summer months. 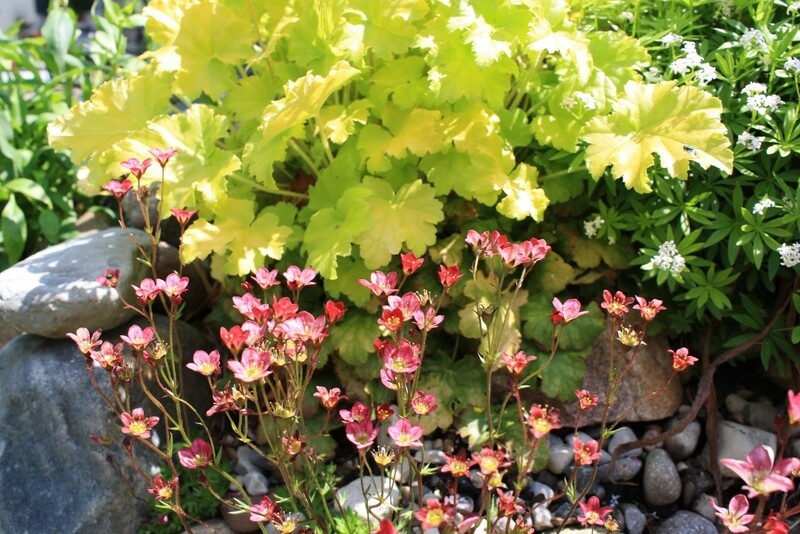 Above is ‘Lime Rickey’ with Saxifraga arendsii, which is a great rock garden plant. It has small gentle pink flowers. 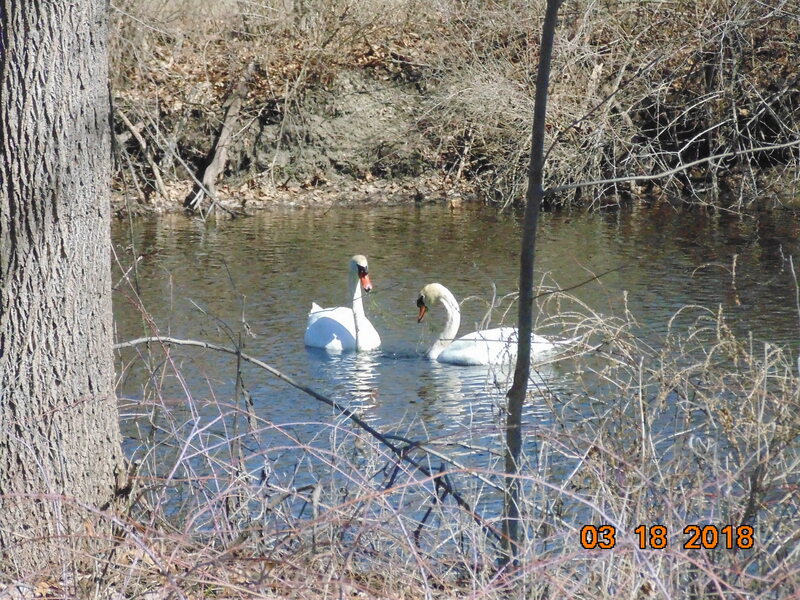 This photo was taken a bit earlier in the spring. The center of this petite flower is a great match in color. Heuchera ‘Green Spice’ was the first Heuchera I purchased. It’s tried and true, bigger and better each year. The blooms are less colorful and not as pleasing. 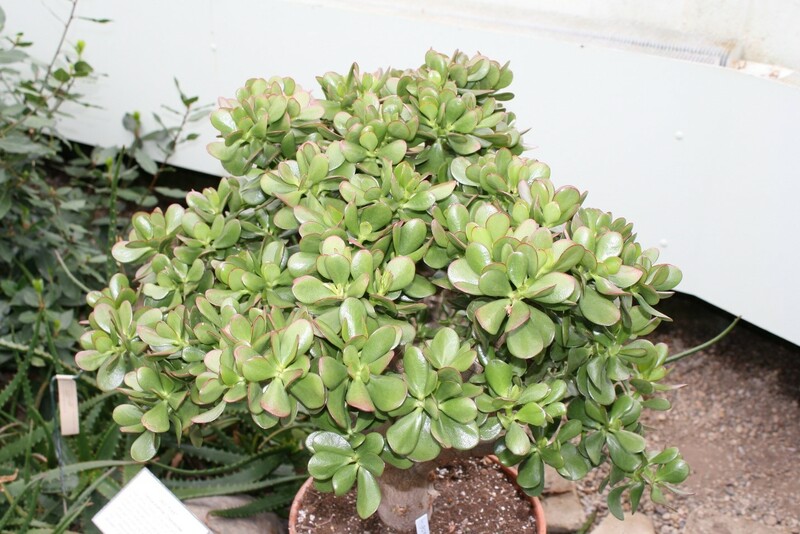 The foliage offers blue green with a red vein. In the photo you can see another ‘Caramel’ along the sidewalk. 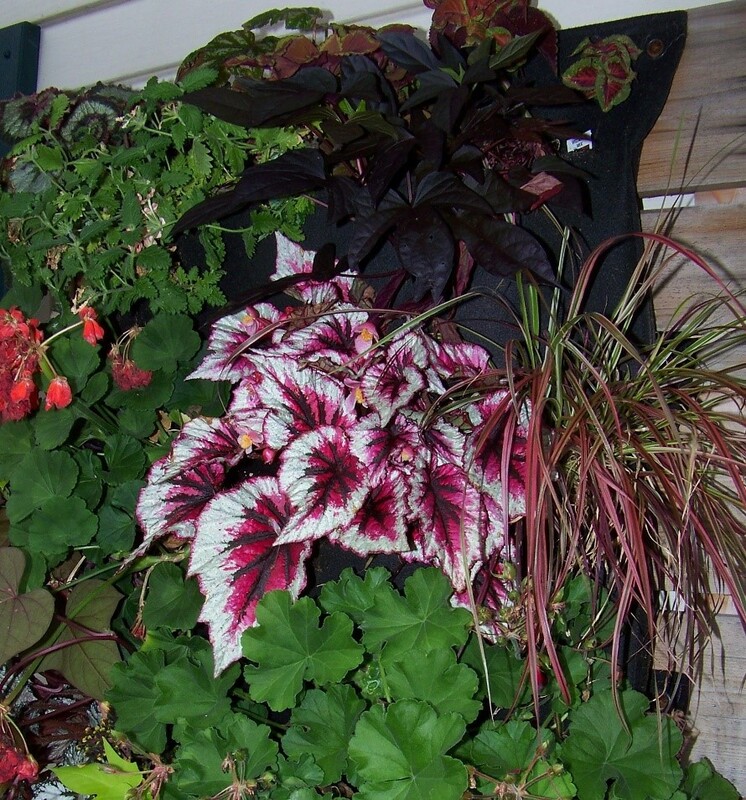 In containers, either side of the pergola posts, are tropical palms, begonia, coleus and Heuchera. This one is ‘Rachel’. It stands up to winter and comes back each year bigger and better. It does seem to seed around more than the others. I find seedlings growing amid the crevasses of the brick pavers. I pull them out and plant them up into a small container. They can be used elsewhere or given away. This is an interesting Heuchera. It’s green with a deep red underneath. The name of this variety escapes me. 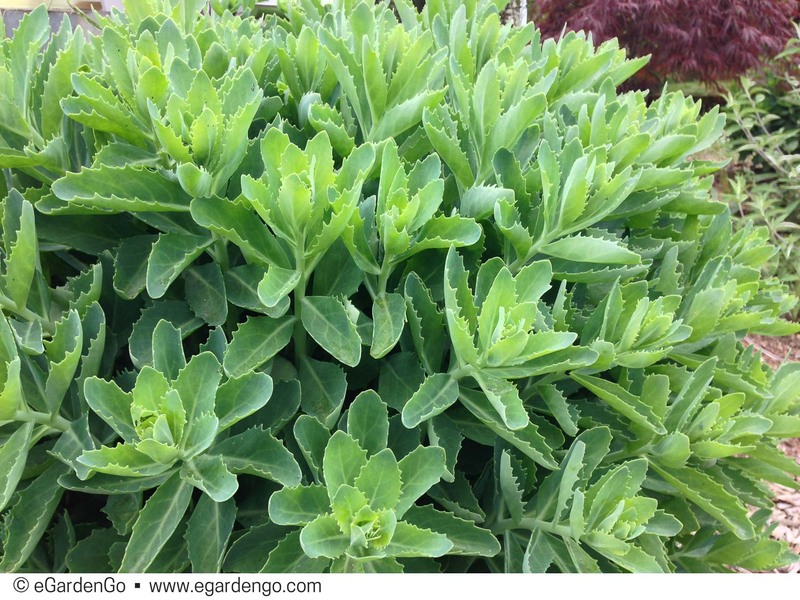 Planted in a semi-circle, it contrasts with ‘Lime Marmalade’ in the center. 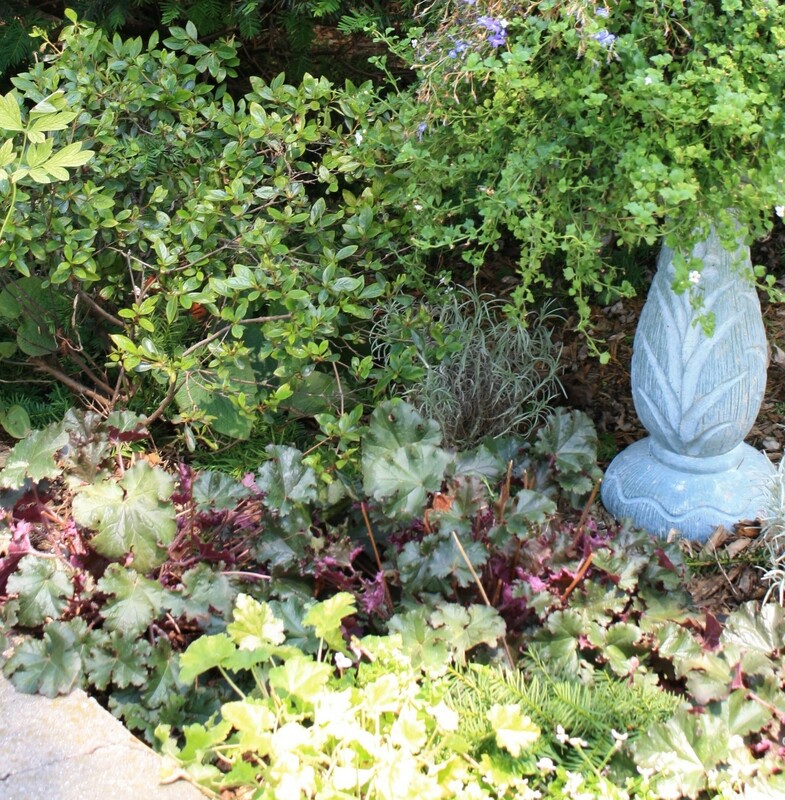 The number of varieties of Heuchera increase each year. One thing I have notices; on many of the new varieties the blooms not as attractive. 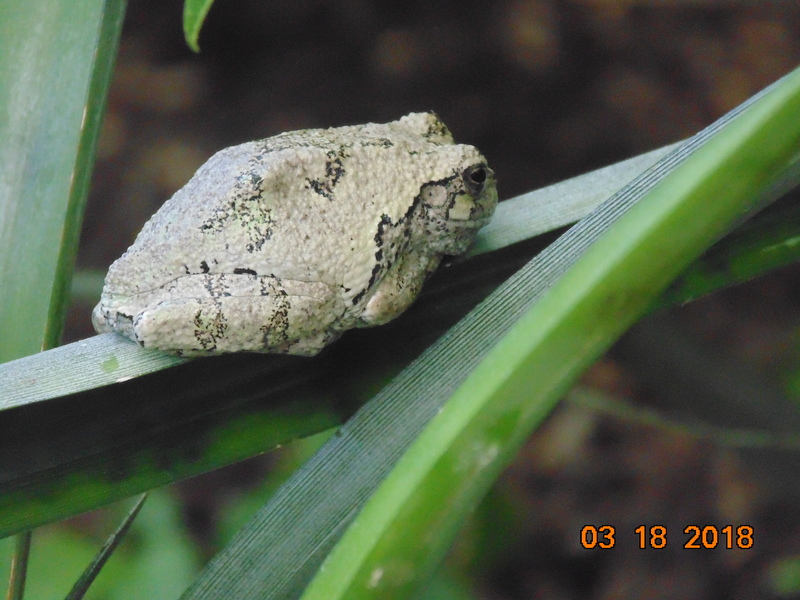 They are a dull beige coloration in appearance and form less of a bell shape. 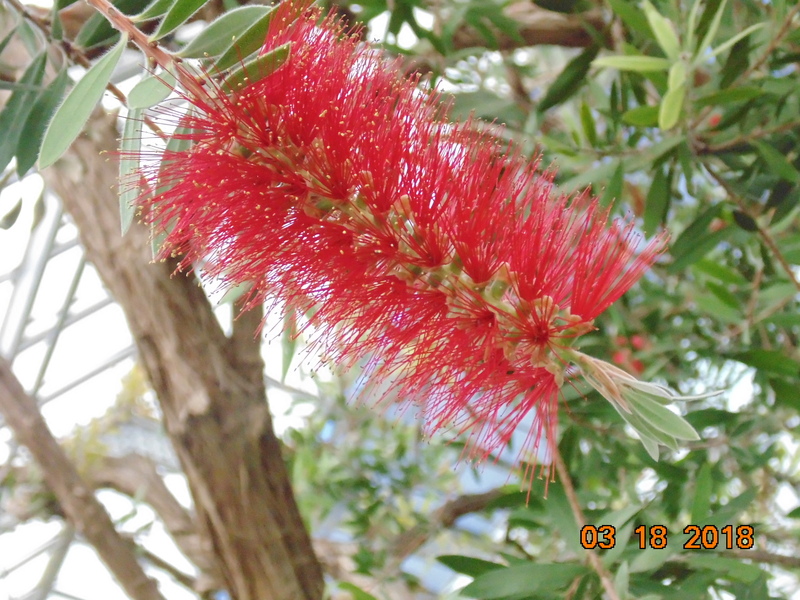 However, with all the color variety offered in the foliage, sacrificing that small bloom is a trade off foliage loving gardeners are willing to take. 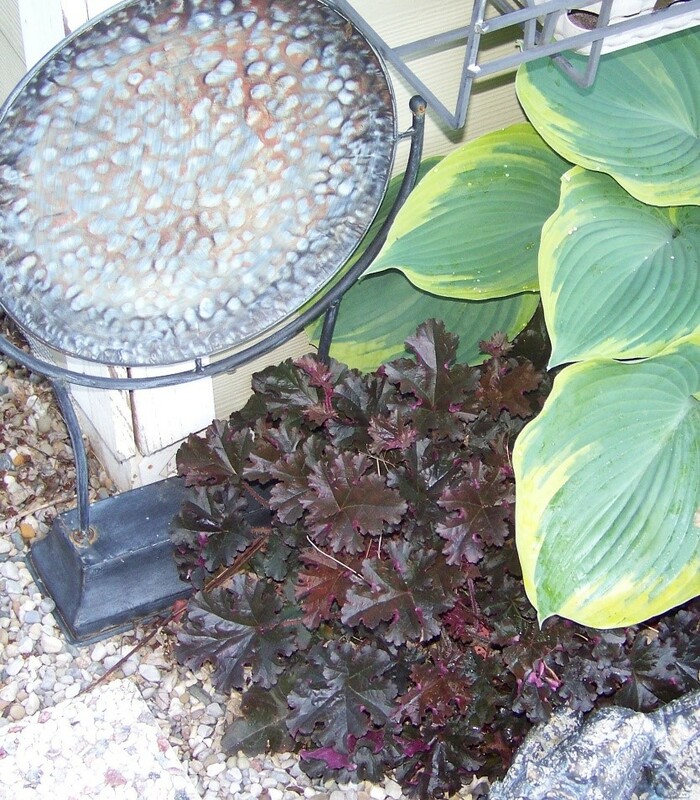 I chose these interesting foliage begonias to feature this week. 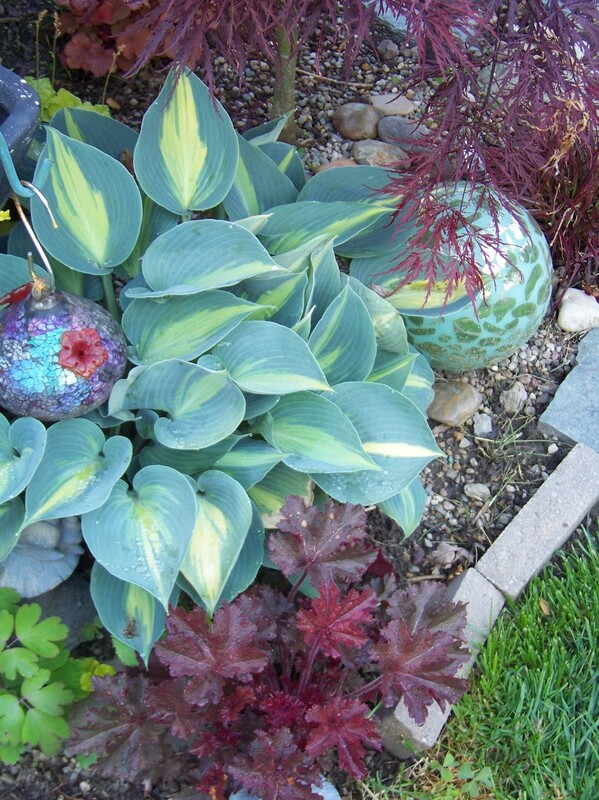 Hope you enjoy the shapes, textures and colors offered and use them as an addition to your garden. 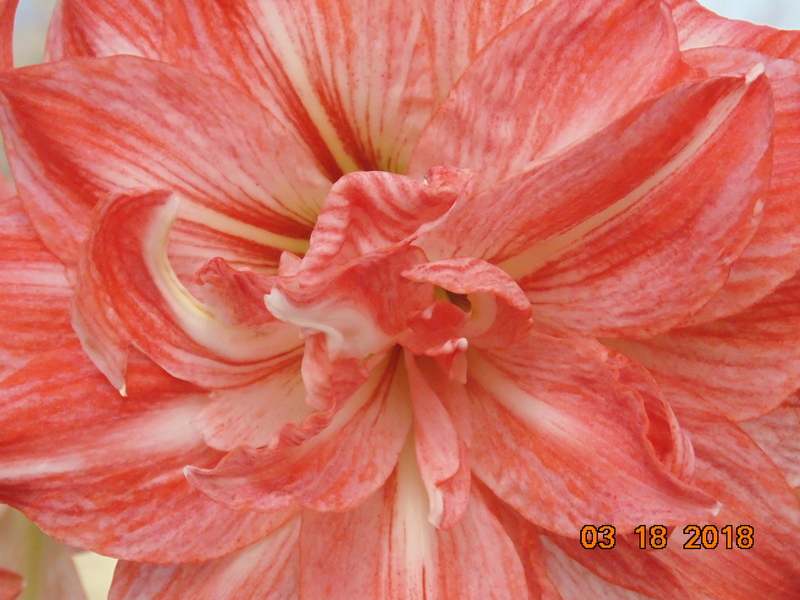 We are all familiar with the flowering annual begonia that we purchase from the garden center. But as a foliage plant, I want to speak on the ones where the foliage is the star. 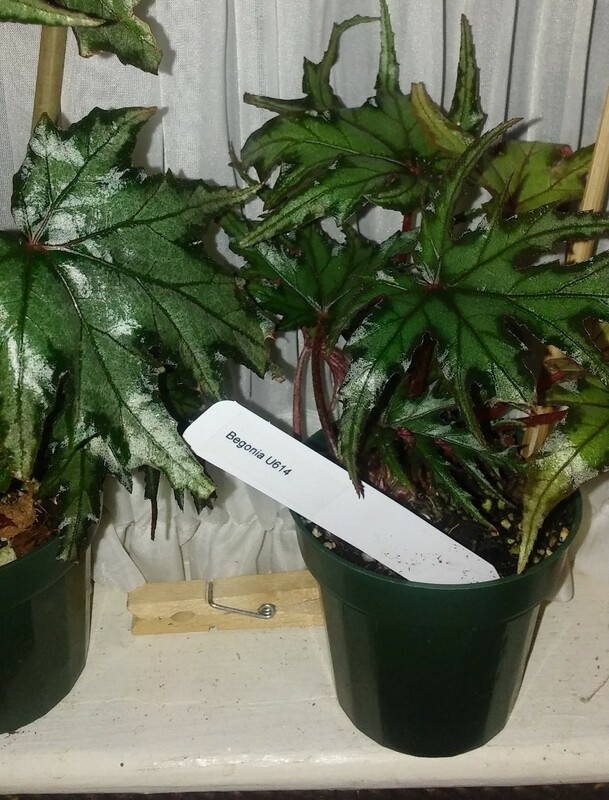 Let’s begin with the Rex Begonia (Begonia Rex-cultorum group). This variety can create a conversation by just one look. 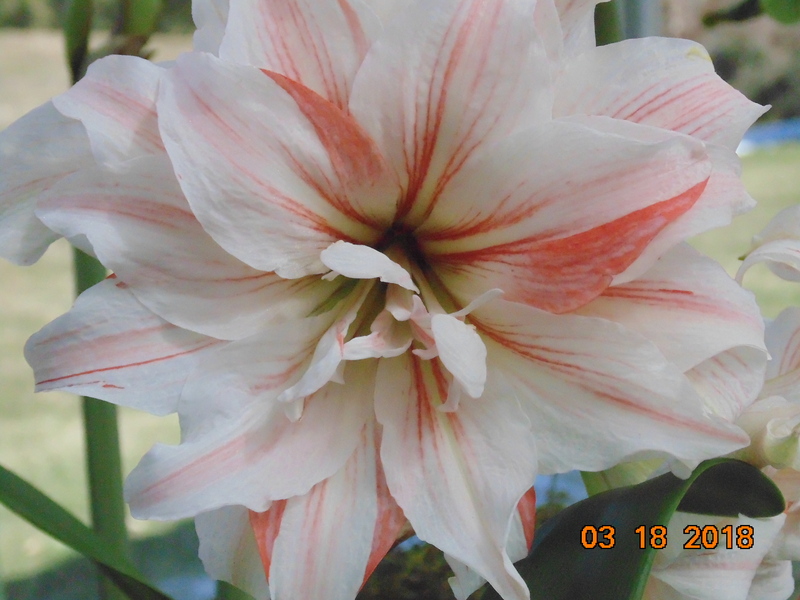 During presentations on gardening, I use some of the photos of the Rex variety. These always seem to perk up the crowd…many asking “What’s that plant?” Don’t expect much of a bloom, it’s mainly grown for its fabulous foliage. Many carry great textural characteristics. With foliage like this, who needs a bloom? The first photo is a Proven Winner. The name is Pegasus. You can find this in almost all the home centers. I like the contrast on the red underneath to add a bit more color. It can stand partial shade as well. 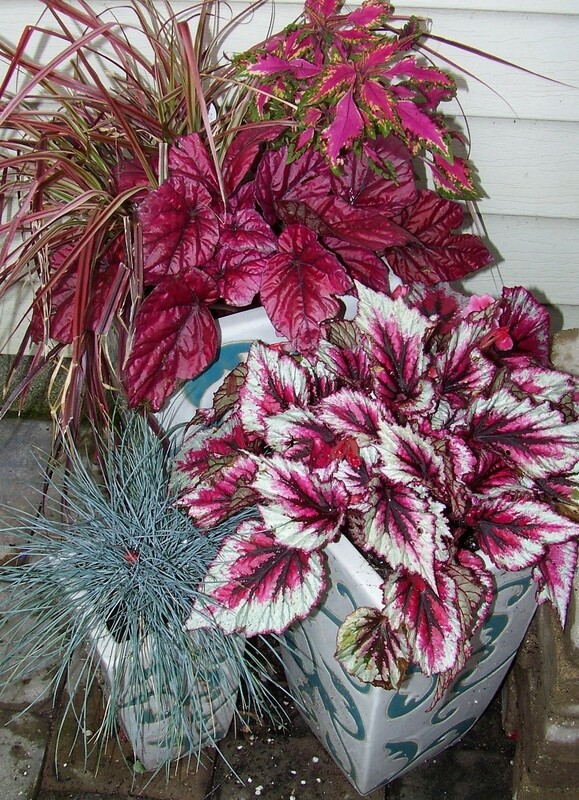 The red one below is Begonia (T Rex Variety) Ruby Slippers. If you need red in the garden, this is a great pick. 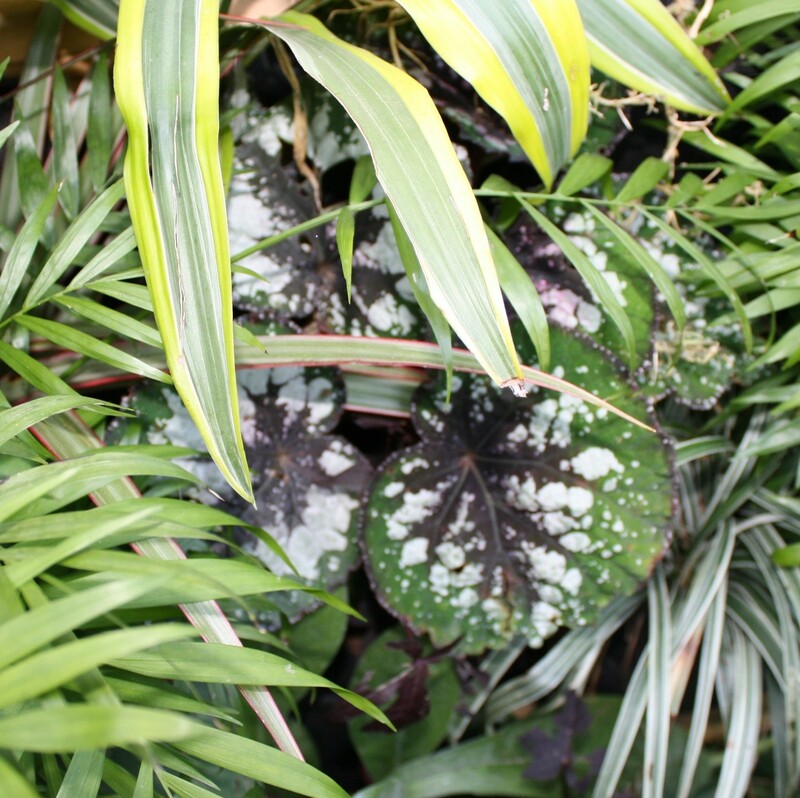 Just below it, in the same photo, is Begonia ‘Shadow King Cherry Mint’. These two pairs very nicely with the blue fescue and Japanese blood grass. The blues also tie in with the color of the pots. I purchase a few of these every year. ‘Shadow King Cherry Mint” has a great serrated edge with a slight border of the red to it. Here you see it in one of my vertical gardens just after I have planted it. It’s surely one of my very favorite. Again, grass was used here as well for contrast foliage. Do you want a conversation piece? 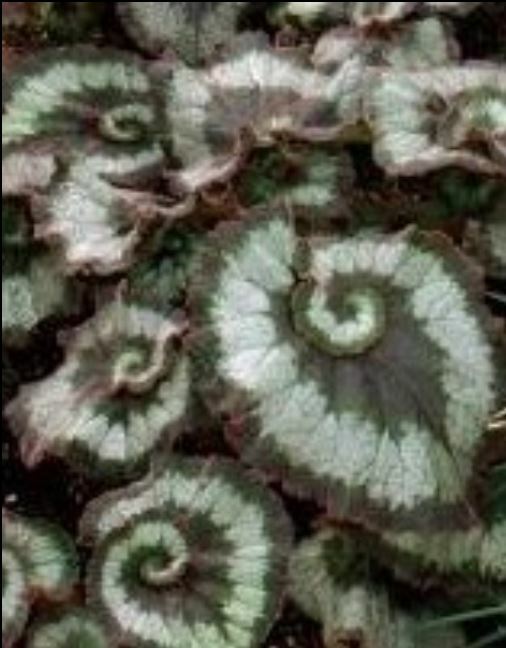 Then purchase this Begonia ‘Escargot’. 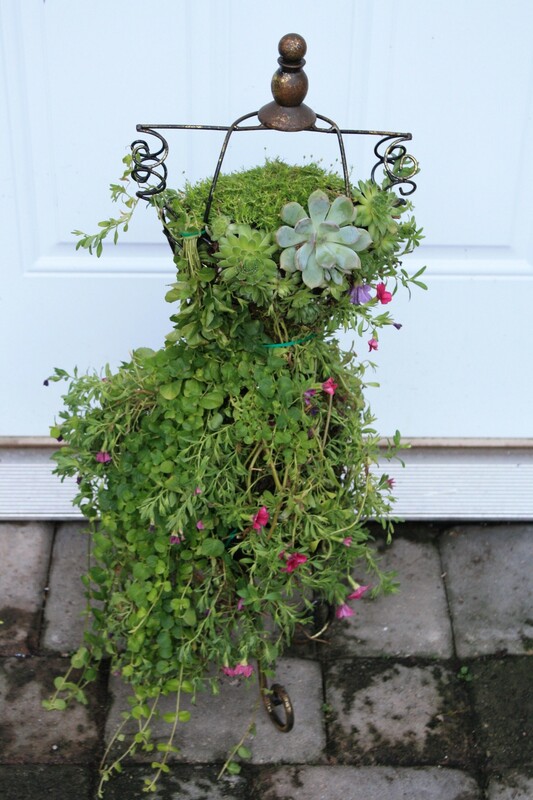 It’s not easy to find in the garden center, however they are available online. 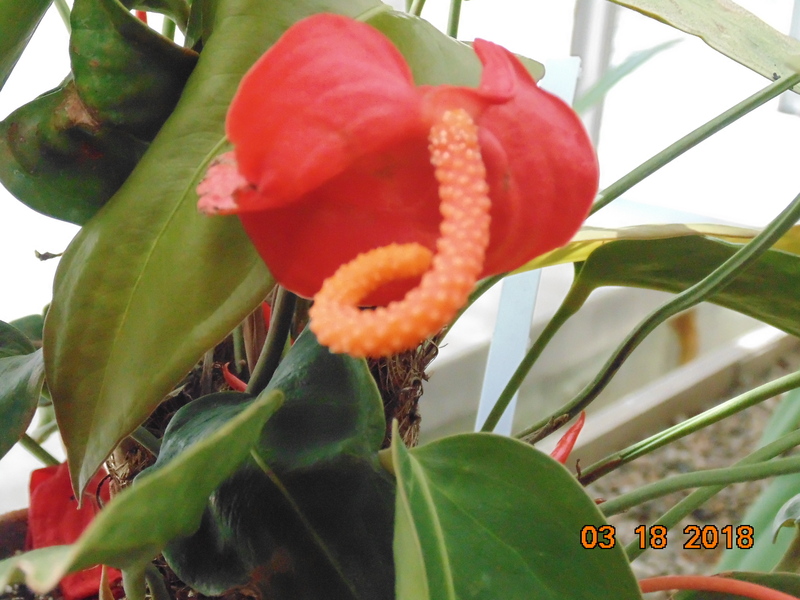 I have seen it during the winter months in the house plant section. The contrasting color and unusual shape always starts a conversation. Popping into view, in the pot below, is another favorite. It’s a Rex variety called Nebulosa. 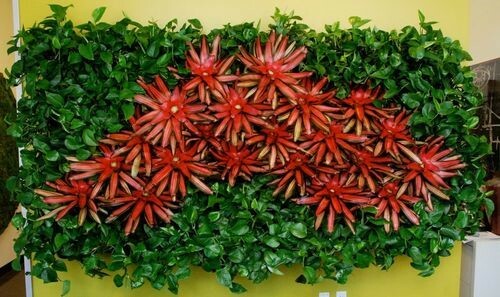 This is placed in a vertical garden on a wall of my garage. This one offers color, lots of texture and “freckles” of white on the outer rim. Next is one called ‘Pink Minx’. I enjoy adding some pink flowers along with it. Love the silver gray foliage. It pairs nicely with Shadow King Cherry Mint as well. You can see it in the background. These favorites are repeatedly used in my container plantings. This photo shows the repetition in just one small area of my garden. Begonias can be propagated by a cutting into a glass of water in a bright window, or by leaf cuttings into a light medium. Most used in my garden are Rex varieties. They generally are purchased locally. While doing this article I came across a great rust color one. I ordered it online from a nursery just outside of Canton, Ohio. The name of the nursery is My Green Obsession They should arrive any day. But for now I will have to give you a link to see a photo. The name is “Autumn Embers”. 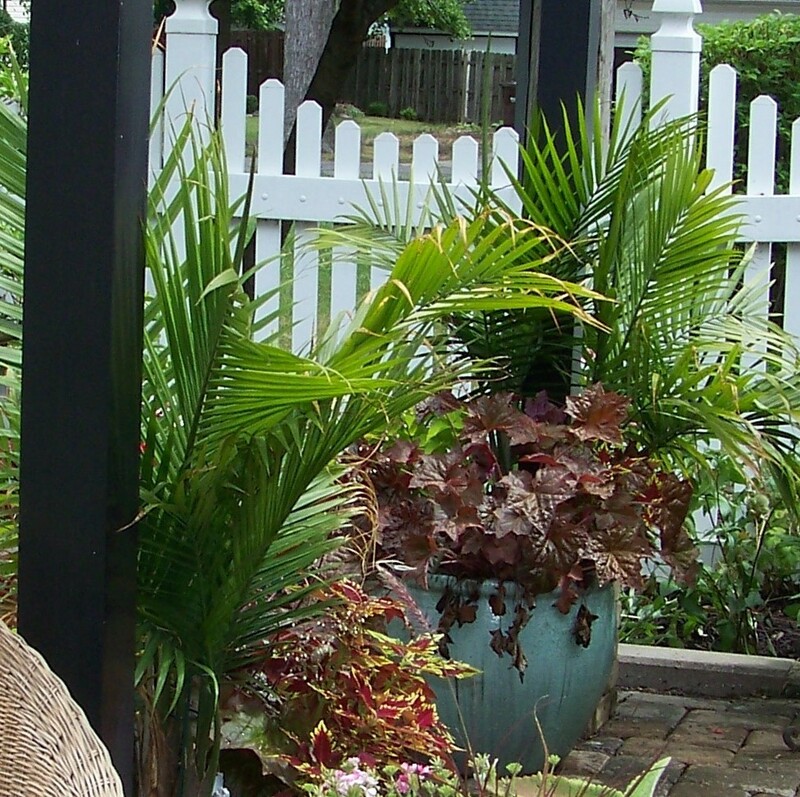 This one will make a great addition to containers with coleus, crotons and canna Tropicana verities. https://www.google.com/search?q=begonia+autumn+embers&tbm=isch&tbo=u&source=univ&sa=X&ved=2ahUKEwjT7bzFjbLaAhXJ3YMKHf8sBB8QsAR6BAgAEDc&biw=942&bih=921. 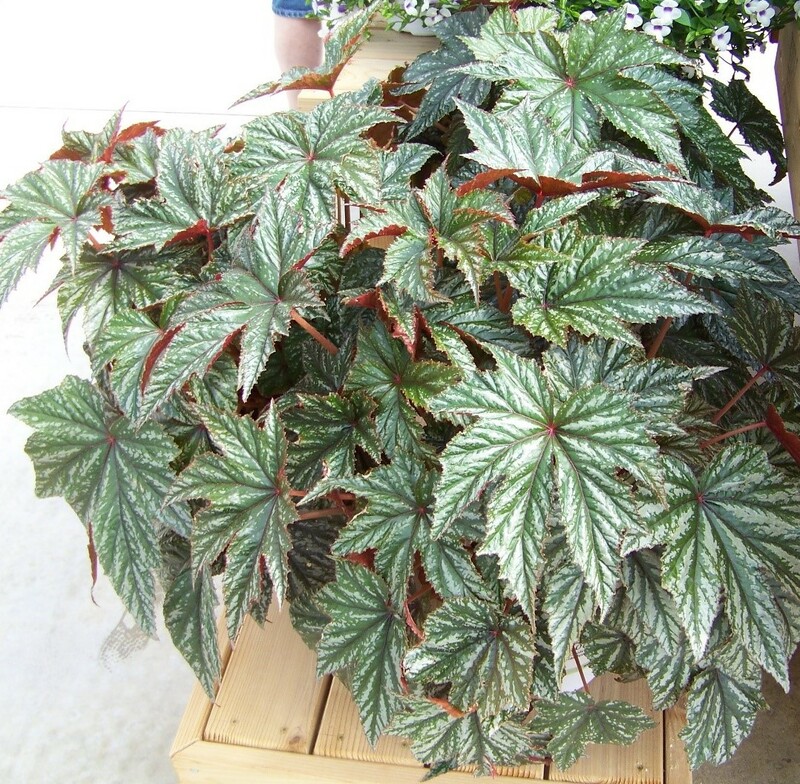 Or if you enjoy Pinterest, do a search for Rex Begonia. Enjoy the numerous photos that will come up with the search. Certainly these will become a staple in the garden. 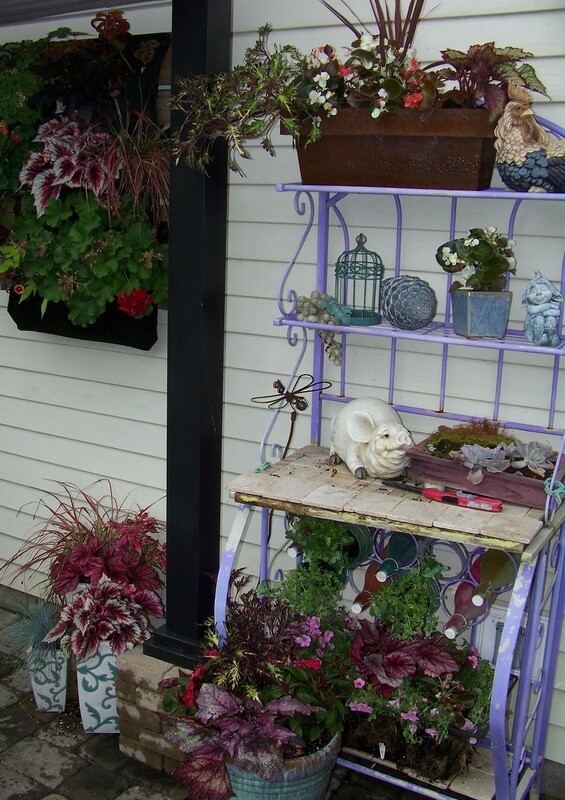 The offerings of color, texture and shape will enhance any container, or bed. 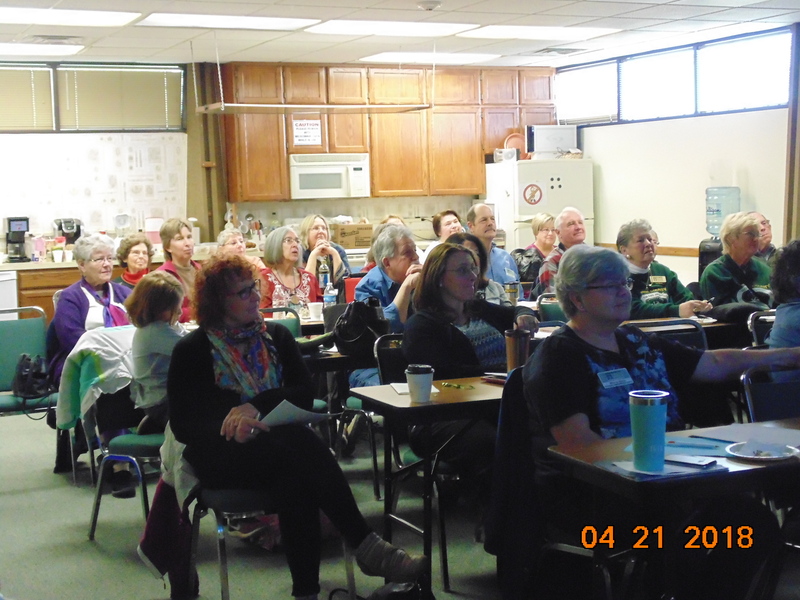 About our demonstration gardens: It seems a cold, rainy early spring and Monday, April 9 is forecast more of the same, so we are not planning to work that morning. However, it puts us behind so we will aim for the following Monday and probably every Monday with decent weather this month. Let Jennie know if/when you plan to come and want company or want to know if plans change. 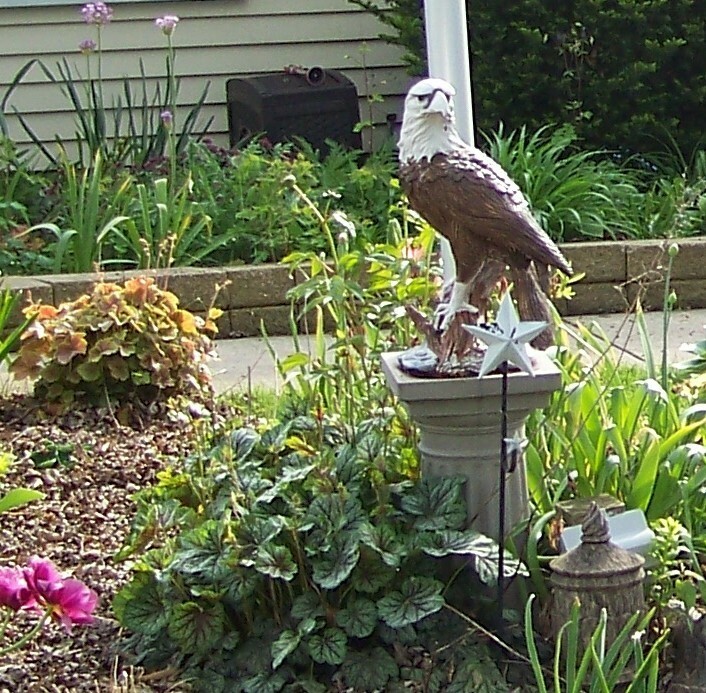 Tasks include pruning shrubs and digging plants out of the rain garden. 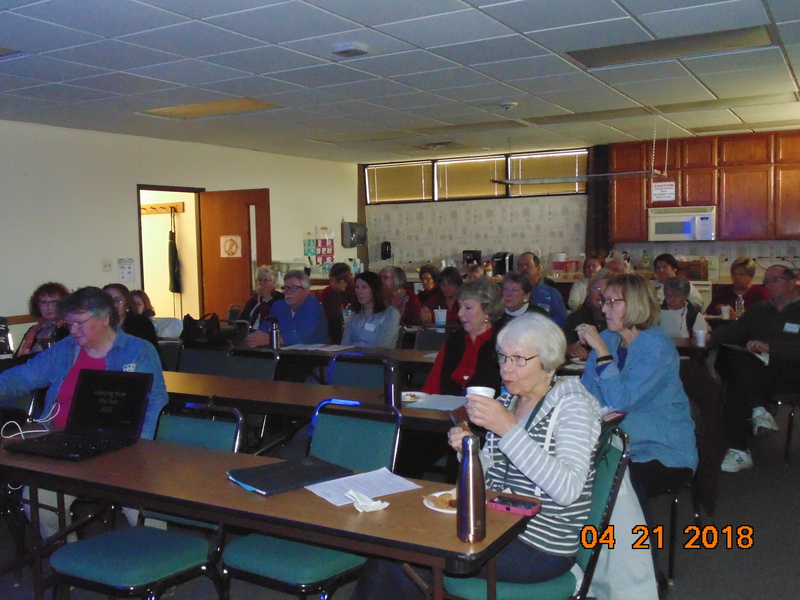 Don’t forget we have a good speaker coming to the April 21 meeting, and the May meeting will include an opportunity to purchase heirloom tomato plants from Bob Bransky, like last year, before the meeting and during the break.